Something weird happened when I went to my choir practice today – something very weird. When I got to the building where we have our choir practice each week, I noticed that there were police vans lining the street – a lot of police vans. As I kept walking, I saw that there was a crowd of protestors and police officers in front of the building and that the building was blocked off. At first, I felt a bit nervous to try to go into the building. I saw a few other people with sport bags talk to the police and they were permitted to go in the building, but I waited for a while until I saw a few other people from my choir arrive. We asked if we could go into the building and they asked for our names. They had a clipboard with all of our first names on it. I gathered that no one else was allowed in the building. I found the fact that there were so many police there really unnerving. There were dozens on the street, in front of the building, in the building, and in the courtyard. Someone else asked what was going on and one of the police officers said that they were clearing out an apartment squat but wouldn’t really explain further. A few other members of my choir were simply told it had nothing to do with our choir. During our break, a woman in our choir spoke up and explained the situation a little bit more. She knew more about what was happening and had been following the situation for a while. In the floor below the coworking space where we practice, a social organization had been renting the space. They mainly work with immigrants, people from immigrant backgrounds. Their rent was increased a lot recently and they could no longer pay it. They were told they must leave by March 27, and they said they would not go without a protest, so the police were called over to counter the protest. The protest was planned for 9 a.m. Friday morning, but for some reason, the police were there tonight. I walked down the stairs to check my bike shortly after I arrived (I was nervous that I’d forgotten to lock it during the confusion) and There were also police in front of the space that was being evicted. I’m not sure if they were evicting them early, but it kind of seemed that way. Anyway, we decided to go downstairs to see what was going on on the street at that point. We had looked out the windows and it seemed like there was no one in front of the building anymore and that the protestors were on the other side of the street. When we got to the street, we saw that the police had totally cleared the sidewalk in front of the building and weren’t letting anyone on that side of the street. We told them that we were just going out for a bit but that we were in the choir practicing there and would be back. We went to the other side of the street to see what was going on. The protestors seemed just as disturbed by the sheer police presence as we were, but were overall pretty peaceful and respectful. We went back to our practice and were stopped a couple of times and almost were not let through (it would have really sucked if we couldn’t get back in the building, because I’d left my wallet, keys, and phone in my bag in our practice space). When we went back in the building, two police officers escorted us back to our floor. The whole thing disturbed me for a few reasons. First of all, the huge amount of police is really unnerving. It certainly didn’t feel like a free country where people could openly voice their disagreement about what was going on. 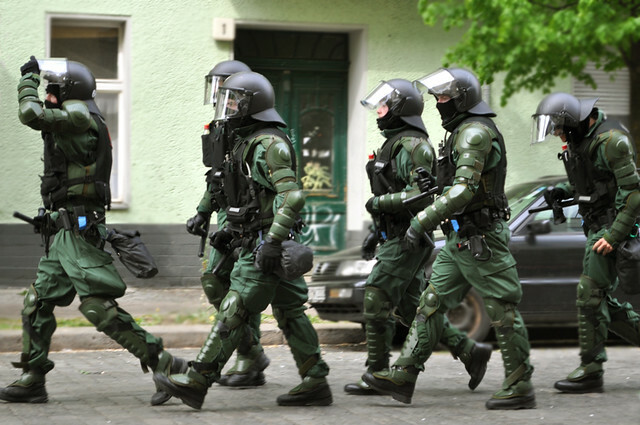 Berliner Zeitung reports that there were somewhere between 100-200 police officers present for around 100 protestors. I noticed that a lot of them had riot gear and there were a lot of huge police vans there. To me, that really seems like overkill, and I think it made the situation a lot more tense than it had to be. Second of all, the lack of transparency bothered me. This wasn’t some sort of secret service initiative, but the police were not clear about what was going on. They also apparently would not let press in the building, which I find really fishy. Third, the police officers treated us with a lot of mistrust, even after we explained why we were there. That bothers me. How can people be expected to have trust in the police system when the police automatically treat the people with mistrust? I feel a bit nervous writing this, as press were not allowed in the building and I gather that the police didn’t want people reporting about anything going on in there. Still, I don’t really know what was going on in there, even though I was in the building, and I feel that it is within my rights to share my experiences. Apparently the police were not clearing out the space last night. They were preparing for clearing it today and trying to prevent a sit-in taking place in support of the organization. The eviction is taking place this morning as planned.